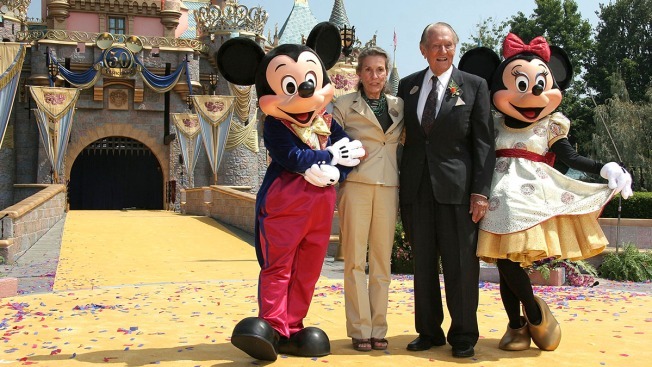 Diane Disney Miller, daughter of Walt Disney poses with actor Art Linkletter, Mickey and Minnie Mouse at Disneyland's 50th Anniversary re-dedication ceremony held at Disneyland on July 17, 2005 in Anaheim, California. Diane Disney Miller, a Bay Area winemaker and the daughter who inspired her dad, Walt, to create the Happiest Place on Earth, died Tuesday in Napa, Calif., at age 79. Walt Disney had said that came up with the idea for Disneyland after watching daughters, Diane Sharon, ride the merry-go-round at Los Angeles' Griffith Park. Now, families who flock to Disneyland in Anaheim, Calif. and Disneyworld in Orlando, Fla., can thank those two girls for that simple ride. "We are deeply saddened by the loss of Diane Disney Miller and our thoughts are with her family during his difficult time," The Walt Disney Company said in a statement. "As the beloved daughter of Walt Disney and one of his inspirations for creating Disneyland, she holds a special place in the history of The Walt Disney Company and in the hearts of fans everywhere. She will be remembered for her grace and generosity and tireless work to preserve her father's legacy, and she will be greatly missed by all who knew her." Miller succumbed to injuries suffered in a fall a few months ago in Napa, where she had a home, according to the San Francisco Chronicle. She had lived in the Bay Area since the mid-1980s, according to the Chronicle, and supported many charities and community functions. As the only surviving child of Walt and Lillian Disney, Miller was the president of the Walt Disney Family Foundation and co-founder, with her son, Walter Elias Disney Miller, of the Walt Disney Family Museum. It opened in 2009 on the Main Post of the Presidio of San Francisco, not far from her residence on Russian Hill. Last year more than 100,000 people visited the museum, which is on track to hit 150,000 in 2013. Miller was a generous philanthropist whose support of Frank Gehry as the architect for the Walt Disney Concert Hall is widely credited with allowing that building's construction to go forward when Los Angeles Mayor Richard Riordan questioned Gehry's firm's abilities. When Miller was born in 1933, the Times' headline read: "Mickey Mouse has a daughter." Her death came one day after the 85th anniversary of the introduction of Mickey Mouse, who made his debut in the 1928 short film "Steamboat Willie," according to Today.com. Miller was Disney's last surviving child. Sharon died in 1993; Walt Disney died in 1966, and his wife Lillian in 1997.She is survived by her husband of 59 years, Ron E. Miller, who served as president and briefly as CEO of the Walt Disney Company, and their seven children.